Beth She’an National Park in northern Israel provides a unique opportunity to observe the remains of a series of settlements from near the beginning of civilization to the Byzantines. Beth She’an is strategically located at the intersection of ancient trade routes about 17 miles south of the Sea of Galilee, just west of the Jordan River. 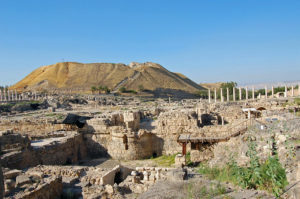 According to archaeologists, residents of Beth She’an, who first settled in the area about 7000 years ago, built a series of villages atop the ruins of earlier ones, creating an artificial hill called Tell el-Hisn (Castle Hill). In the fifteenth century B.C., Egyptians under Pharaoh Thutmose III captured the area and created an administrative and military center on the hill. In the twelfth century B.C., the Egyptians lost control of the area to the Philistines, who had arrived from somewhere in the Mediterranean and used Beth She’an as their base. According the Bible, the Philistines defeated King Saul at nearby Mt. Gilboa and hung his headless body on a wall of Beth She’an. King David later drove the Philistines from the area, making Beth She’an part of the Kingdom of Israel. When the Assyrians conquered Israel in 732 B.C., they destroyed Beth She’an. The Greeks, who conquered the area in the fourth century B.C., built a new city called Scythopolis at the base of Castle Hill. When the Romans captured the area in 63 B.C., they expanded Scythopolis, adding a theater, a hippodrome and a colonnaded main street. By the first century, Scythopolis had become the capital of the Decapolis, a loose confederation of ten Greco-Roman cities mentioned in the New Testament. By the fourth century, Scythopolis had become a Christian city, with a number of important churches. There are many things to see and explore in northern Israel. Beth She’an National Park should be on everyone’s must see list.